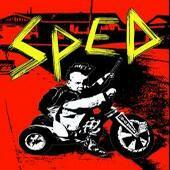 Sped is a band of NYC punks whose raucous delivery, sardonic attitude, and bratty vocal style embodies the spirit that once commandeered the Lower East Side before gentrification. Despite demonstrating their wares via a two-song sampler, this unit’s brash and bold presentation boasts an authentic albeit brief punk rock bite with a buoyant bounce that fans of NOFX, All, and Dead Kennedys will have no problem getting their pogo on to. For more information, check out http://www.myspace.com/spednyc.